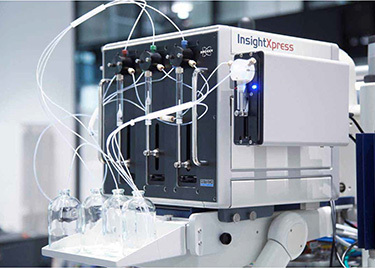 TgK Scientific’s new InsightXpress stop-flow delivery pumps enable the screening of reaction conditions by nuclear magnetic resonance (NMR) at an unprecedented speed for industrial and academic scientists studying or optimising reactions, with extremely low sample volumes and a dead time of less than 150 ms. Variable ratios of reagents to explore different reaction conditions and fast flow-rate injection of 0.2-2ml/s offer great versatility in use. Verotec was selected as the enclosure supplier for several main reasons. Low to medium volumes are expected, so using modified standard products did away with up-front expensive tooling, and time to market was minimised. Verotec supplied 3D files of the standard products, and then imported the required modifications back into its CAD system to create manufacturing and assembly drawings, simplifying the design cycle. The firm's in-house capabilities, which include mechanical assembly, screen printing, a mix of soldered and crimped cabling and electrical test, enabled a complete solution to be provided. InsightXpress is housed in an application-specific Verotec 6U half-width 320mm deep EMC screened Diplomat enclosure. The unit is fully wired and fitted with three interface control boards, one for each of the three pumps that enable the reagent mixture to be varied. Verotec also manufactures and fits custom machined piece parts into which the free-issue high precision pumps are mounted. An optional fourth pump is housed in another product, the LBX enclosure, which when extending the core system capability is mounted to the standard front to rear heavy-duty extrusion on one side of the Diplomat.